Plastic is lightweight, flexible, durable, and relatively inexpensive to produce and buy. These qualities make it ubiquitous in everyday life. Although it certainly makes our lives easier, the fact that we can carelessly dispose of plastic without thinking about the repercussions is a big problem. A 2010 study estimated that a whopping 4.8–12.7 million metric tons of plastic waste entered the oceans that year. The level of plastic pollution in our oceans is staggering. A 2010 study estimated that a whopping 4.8–12.7 million metric tons of plastic waste entered the oceans that year. That is equivalent to approximately 34 000–90 000 blue whales! Surprisingly, the stats do not get any better as we move farther away from civilization. A recently published study estimated that there were 37.7 million pieces of plastic debris (weighing a total of 17.6 metric tons) littering the beaches of Henderson Island, a remote island in the South Pacific. Twenty-three percent of the plastic items there came from South America, which may be the result of Henderson Island’s position near the centre of the South Pacific Gyre. However, the researchers identified plastic materials from countries all over the world, including Canada. A recently published study estimated that there were 37.7 million pieces of plastic debris (weighing a total of 17.6 metric tons) littering the beaches of Henderson Island, a remote island in the South Pacific. 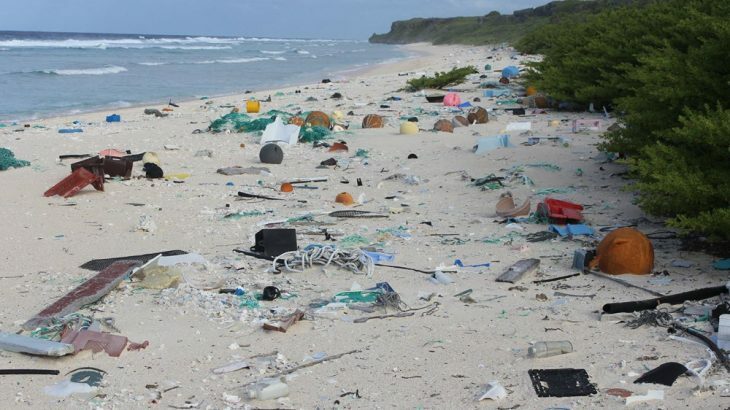 Small plastic items made up 61.6% of the debris recorded on the beaches of Henderson Island. This is not unexpected because approximately 90% of plastics found in marine and freshwater environments are microplastics (< 5 mm in diameter), which include both broken down pieces of plastic and products like microbeads. Their small size makes it possible for them to pass through wastewater treatment plants and into the digestive tracts of all kinds of aquatic animals, including fishes. Plastic waste on Henderson Island creates physical barriers for animals like sea turtles attempting to lay their eggs, increases the hazard of entanglement for coastal-nesting sea birds, and lowers the diversity of shoreline invertebrates. Henderson Island may have grabbed the headlines, but every major ocean has trash vortices filled with plastic and other garbage. The largest is the Great Pacific Garbage Patch (or Pacific Trash Vortex) in the North Pacific. This is a big problem for marine life, causing seabirds to starve because their stomachs are full of plastic, and sea turtles to mistake plastic bags for their jellyfish prey. Zooplankton have also been recorded ingesting plastic, meaning that the problem starts at the very bottom of the food chain. Henderson Island may have grabbed the headlines, but every major ocean has trash vortices filled with plastic and other garbage. Fortunately, solutions are being developed to help combat the problem. The Ocean Cleanup developed a passive floating technology designed to catch plastic debris using ocean currents. The captured plastic is retrieved and repurposed as much as possible. Closer to shore, the Seabin project offers a floating debris interception device designed to be installed in the waters of marinas and ports. However, one obstacle is making the cleanup very challenging: plastic is not biodegradable on a human time scale. Amazingly, nature may offer a solution to this human-created problem. It turns out that what’s useless trash to most organisms can be food for others. Scientists are on the lookout for these special organisms, whose voracious appetites can help break down plastics more quickly. So far, they have found a few potential candidates including bacteria, fungi, and wax worms. It turns out that what’s useless trash to most organisms can be food for others. For example, a Japanese research team discovered the first organism able to breakdown PET, or polyethylene terephthalate. At 30°C, the bacterium Ideonella sakaiensis can degrade almost all of the exposed PET within 6 weeks. This is phenomenally fast compared to its 100-to-400-year biodegradation rate in a landfill. Similarly, a team of researchers in Portugal found that the marine fungus Zalerion maritimum can degrade microplastic. This is particularly exciting news as Z. maritimum is naturally occurring in maritime waters. This means that the marine fungus holds great promise for remediating microplastic pollution in the future. …the larvae of the greater wax moth, Galleria mellonella, have a taste for PET. Researchers have also discovered that the larvae of the greater wax moth, Galleria mellonella, have a taste for PET. These parasitic wax worms usually live in beehives and feed on beeswax, but due to the similar chemical structure of beeswax and polyethylene, these worms can feed on polyethylene too. Tiny organisms like these offer real hope for mitigating plastics pollution. Given their convenience, it’s unlikely we’ll get rid of plastics anytime soon. But, as this research shows, we can lessen the environmental impact of plastics by reducing how much we use, responsibly disposing of what we do use, and supporting research into better solutions. Want to see where plastic in the oceans ends up? Go to PlasticAdrift.org. *Header Image: Plastic debris on East Beach, Henderson Island. Photo credit: Dr. Jennifer Lavers, University of Tasmania, Australia. Used with permission. Biology and Life Sciences, Environmental and Earth Sciences biodegradation, Catherine Lau, Henderson Island, Lené Gary, microplastic, ocean pollution, plastic pollution, Tanya Samman, The Great Pacific Garbage Patch. permalink.